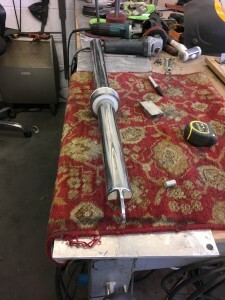 Leg one is completed. We are in Lowestoft. We arrived yesterday at 1345. 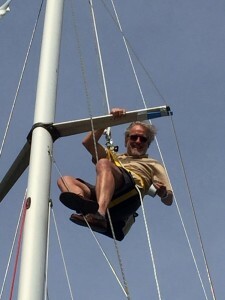 It was a very windy sail under a reefed genoa in SSW 5-6’s gusting 7’s. I feel out of kilter. Out of tune with the boat. There is a combined rhythm missing as if I’m on the outside looking in at ‘Talisker 1’ and me. Today I’m off to Charity & Taylor for charts. 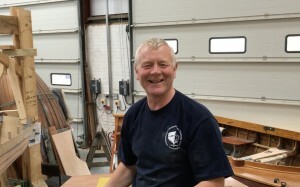 Bill Hughes is going to give me a tour of the boat building school. I’m looking forward to that. I nearly went there myself in 1993. Quite a bit has happened over the last few days. 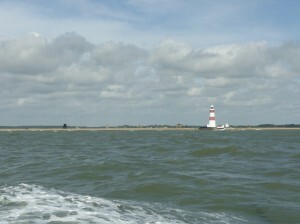 On Friday I sailed from Orford to the Orwell. 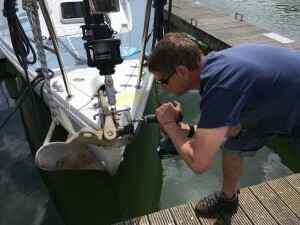 Tim, Mr Stainless, had manufactured me a bowsprit and it was going to be easier to fit at Suffolk Yacht Harbour. I could then load the boat for the coming voyage from a pontoon. It was a bright sunny day with possible signs of Thunder …. I expected to motor in very light easterly winds. 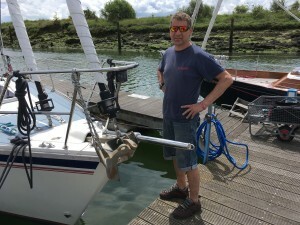 In fact we sailed from Orford to Woodbridge Haven with about 6 knots over the deck before the wind virtually died and I started the engine. I decided to go inside Andrews Spit. 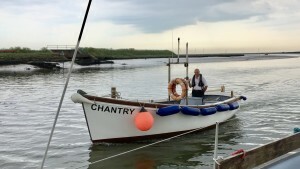 For those of you who have not done this you actually virtually touch the beacon on the Languard breakwater as you pass through a narrow channel between the shallows and the beacon. The sky was clear as we passed Felixstowe Pier but as we approached the beech the skies started to darken quickly over Harwich. I felt we were in the wrong place but we should be through before the storm. Another yacht was coming the other way having passed inside Andrews Spit. 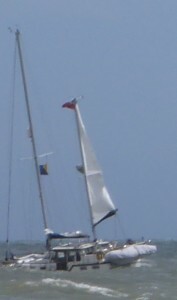 Irritatingly, as much as I tried to encourage her, the yacht was insistent on passing starboard to starboard. The channel along the beech is not that wide as you come level with the fort. We were about to pass each other when the cloud burst hit. 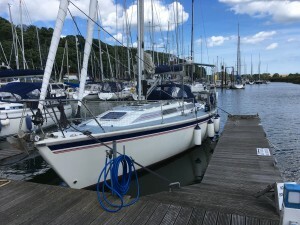 The other yacht unwisely started to unfurl their genoa and with no control of the reefing line the whole lot came out in a rush as she flew past. ‘Talisker 1’ under main only heeled sharply with the first gust as I tried to release the main sheet. Oh fahk! I am in the wrong place … Idiot! 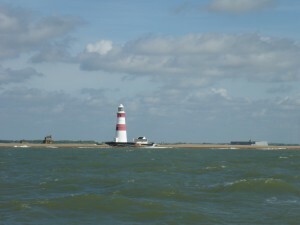 At this point the shingle beech is 30 – 40 metres to starboard. We have little room to manoeuvre. 1730 BST Inside Andrews Spit. “I’m watching the storm approach over Harwich. I’m not in the right place. I can get past the groins and in to deep water before it hits! I don’t! The wind goes northerly, a local storm. 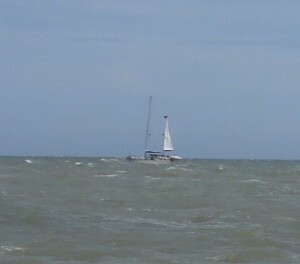 The wind increases and ‘Talisker 1’ accelerates. 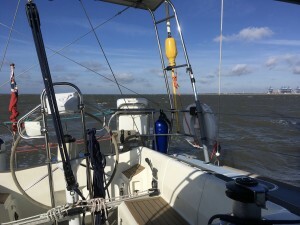 The wind is now too strong (I can’t hold her) and we are heading for the beech. Only yards away ! She won’t tack through the wind with the main hard on. I try to release the main. NO WAY. I jump round the wheel, grab the main sheet and jump on the sheet close to the jammer. In the nick of time we come through the wind and are heading back whence we came. 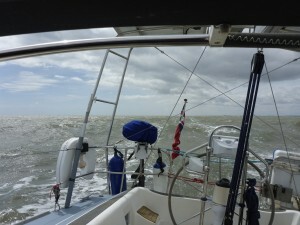 The rain was torrential and did not ease until we approached Suffolk YH. 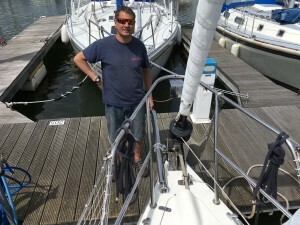 We were secure in harbour engine off at 1845 BST. I’ve talked to Doc and James R. Doc talked about superior knowledge avoiding having to use superior skills and that the latter got me out of trouble but I don’t buy that. 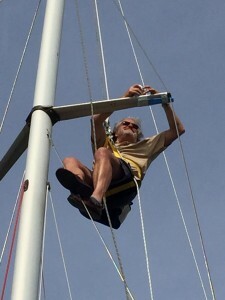 Tim, Mr Stainless, has made me a wonderful bowsprit to fly our cruising chute. 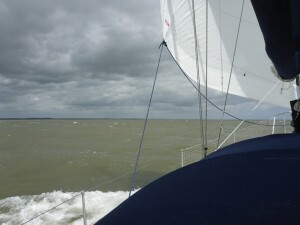 I was jittery sailing up to Lowestoft yesterday and felt nervy about the entrance in the conditions. In the end it was routine. I can’t quite relax. I’m a bit wobbly. 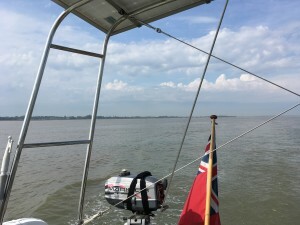 Leaving Port of Felixstowe …. I’m sitting in the RN&S YC writing this. The wind is still very strong from the west but there looks like a window to head north tomorrow or Friday. Probably to Scarborough, which should take about 24H. 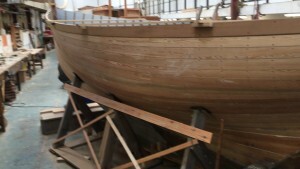 I visited the Boat Building College yesterday. My mate Bill Hughes is doing the course. I’m envious. 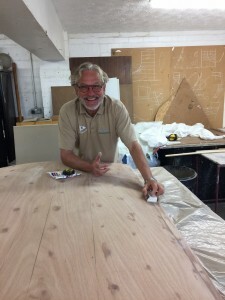 Turning in to a shipwright! Bill proudly wears the college uniform! 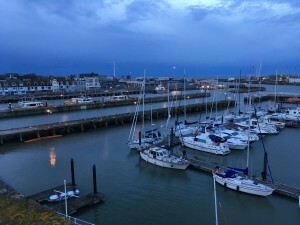 Bill spent the night on board ‘Talisker 1’. It was good to see him and it saved him an hours drive home last night and an hour back to college this morning. 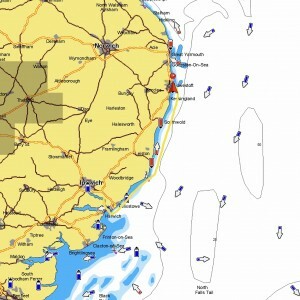 I’ve been to Charity & Taylor and have Admiralty Charts for Faroe together with Navionics Greenland and Iceland. I might not get to Scotland! Think only of the next leg and no further. I’m trying to build confidence again so my only thoughts are the possible passage to Scarborough.